Mainstream media outlets provided extensive coverage of the Women's March in the lead-up to its one-year anniversary over the weekend. The Women's March, now a broader left-wing movement, began as a nationwide protest on Jan. 21, 2017, the day after President Donald Trump's inauguration. Activists who support women's reproductive rights, immigration reform, and LGBTQ equality, among other issues, spearheaded the rallies, which were mainly aimed at Trump himself. Media outlets like CNN, the Washington Post, USA Today, Time magazine, and Bloomberg, among many others, extensively covered the event's one-year anniversary, when activists held the 2018 Women's March. Some outlets called the rallies "the largest single-day protest" in U.S. history. 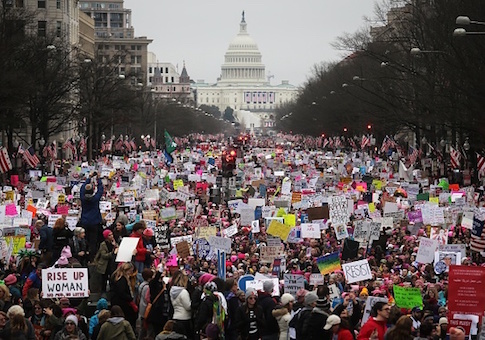 Mainstream publications also attempted to extrapolate the potential significance and political ramifications of the march and an empowered female electorate, reporting on how the event may affect the 2018 midterm elections. These same outlets provided minimal coverage of the 45th annual March for Life, a pro-life rally with tens of thousands of activists in Washington, D.C. President Donald Trump addressed the rally on Friday. CNN particularly allocated a significant amount of coverage to the Women's March and its leaders. MSNBC's "Morning Joe" devoted an entire segment of its show Friday to the impact of the march. Cindi Leive, former editor and chief of Glamour magazine, and Cecile Richards, president of the Planned Parenthood Federation of America, joined co-hosts Joe Scarborough and Mika Brzezinski for a discussion on efforts to harness the enthusiasm of the marchers into a political movement that is capable of electing more women to local, state, and federal offices. On Saturday, Scarborough released a song entitled "Stand," which he said was inspired by "the Women's March and dedicated to those who #Resist." On the track, Scarborough sings: "Once in your life, you may get the chance to stand against a column of tanks. Holding up your hand." The group that organized the Women's March has had its share of controversy over the past year. In July, for example, the group tweeted a happy birthday message to Assata Shakur, a former member of the Black Liberation Army who was convicted of killing a New Jersey state trooper in 1977. Shakur later escaped prison and fled to Cuba, where she has been living in exile. After the "happy birthday" tweet drew criticism from media figures and the public, the group doubled down on its statement, claiming that "the far-right was threatened" by the movement and its "solidarity with other movements." The group also claimed that Shakur is a "civil rights leader" who used her position to "challenge sexism." This entry was posted in Culture and tagged Associated Press, Bloomberg, CNN, Joe Scarborough, Media, Morning Joe, The Washington Post, Women's March. Bookmark the permalink.